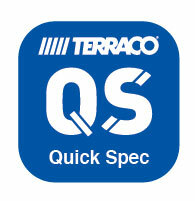 Welcome to Terraco's EIFS Quick Spec service! You are just a few steps away from generating your Terraco EIFS specification. Using this service you will be able to generate a Terraco EIFS specification based on your U-Value requirement by choosing the required Terraco EIFS System and the decorative finish in your choice of texture. Should you require additional technical advice or samples please contact us. Please complete the following information to create your Terraco EIFS specification. Step 5. Enter U-Value to determine the thickness of the insulation boards. Note: Please view Colour & Texture Selector under the Decorative Finishes pages for colour options.